As we said before, in the recent days, Akbar Ganji has revealed his true color and clearly proved that he is an ‘Iranian Baboon’. 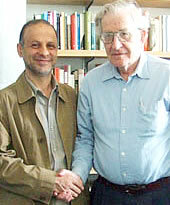 The story of Ganji is a typical story of Iranian fake intellectuals who betrayed the people and their movement in 2009. Iranians ask: “Why our 2009 movement failed and who betrayed us?” For finding the answer, you can think about the story of Ganji very carefully. Ganji and many other Islamist-Reformists and ex-members of Mullah Gestapo pretend that they are intellectual. But Iranians say: “These bastards gained reputation because others can not speak and are suffocated by the savage Mullahs”. And some add: “When only the Islamists (Mullahs or reformists) can talk or write, and others should remain silent or should be killed or tortured, then some one like Ganji can impersonate an intellectual”. As Iranians say: “In city of the blind people, the person who has only one eye is the king“. It’s an Iranian old saying that tells the truth about Ganji and other Islamist-Reformists. The stupid Islamist, like Ganji, are intellectuals in the city of the blind and stupid Islamists, not in free Iran when Iranians and their real thinkers and real intellectuals can talk, write, or speak their minds. When all open-minded Iranians are brutally suppressed by Mullahs, Iran is like the city of the blind people, and Iranian baboons and someone like Ganji, Abdi, Mohajerani, etc can impersonate intellectuals. And that’s why these bastards love the Mullah regime. Without the Mullah regime, and in a free Iran that everyone can talk or write, who cares about these stupid Islamist jerks? So, they defend the Mullah regime, because the Mullahs have created a medieval hell that normal Iranians can’t write, talk, or speak their minds.Some one like Akbar Ganji can gain reputation, only because the savage Mullahs suffocate other voices and other people, and the real intellectuals and wise Iranians can not openly and publicly speak their minds. You can ask: “Why Ganji could write about the chain murders and others could not?” In the past years, the Iranian baboons answered: “because Ganji is very talented and brave. We don’t have any other investigative reporter in Iran [!]”. But now all Iranians know the real answer: “Ganji was member of Mullah Gestapo, and he negotiated and made love with the Mullah Gestapo. But others only could be tortured and killed by the Mullah Gestapo”. Among the stupid Islamist-Reformists, only Mousavi was honest and told the truth. Mousavi said: “I know the people vote for me, because they don’t have any other alternative in the Islamic regime. I know the people were not free and only chose between two evils, and finally they elected me as the lesser evil“. In Iran, only the Islamists can be candidate in the Mullah elections, and the Mullahs don’t allow others to participate in any election. The Mullahs have created a closed society and only the Islamists have right to be active in almost all fields, including cultural and social fields. In Iran, only the Islamist and Mullah mercenaries have right to talk or work in television, radio, cinema, arts, book industry, newspapers and other media, universities, public spaces, etc. These stupid bastards who are illiterate, untalented, and worthless thugs become cultural or social figures, because others are brutally suppressed by the savage Mullahs. Under these conditions, Ganji and other Islamist jerks have delusion about themselves and as Iranians say: “They think AliAbad (a small village) is a city”. In fact, in a free Iran, and when everybody can talk, write, or work, the Islamist jerks become worthless idiots. Iranians say: “if the Mullahs and the Islamists have not a gun in their hands and don’t threaten to kill and torture us, who respect these bastards or listen to their bullshits”. The story of stupid Ganji can show the true meaning of the tragedy of Iranian intellectualism and the tragedy of the fake intellectuals in Iran. As we said before, it’s really shameful that almost all Iranian intellectuals, with only minor exceptions, have been stupid stooge and mercenary. Now, Akbar Ganji has become the last on the long list of Iranian fake intellectuals. As we said before, many believed that the ex-member of Mullah Gestapo can’t become intellectual or independent journalist, but they wanted to give Ganji a chance to change himself. He received so much attention and respect, more than he deserved, but when he had to help the people who made him hero, he betrayed the people. Now, he lives in the US, and like other Iranian jerks who live outside Iran and are mercenary or indifferent, doesn’t care about the victims of his beloved Islamic regime. The young Iranians should try to learn from the shameful fates and shameful stories of Iranian fake intellectuals. The feature belongs to the new generation of Iranians. “The older generations of Iranians, those who are 50+, are very stupid and reactionary, and only when they die, Iran become a modern country and we can enjoy freedom and democracy in Iran. The older generations are disaster makers who created this medieval tyranny by their stupid reactionary revolution in 1979”, many young Iranians say. Now, thousands real but unknown intellectuals live in Iran, and they are not as stupid as their parents and the fake intellectuals and mercenaries who make love with the Mullah Gestapo and are the main responsible for the death of Green Movement and the current situation in Iran. Unfortunately the world still think that these fake intellectuals and mercenaries are symbol of the Iranian intellectualism! It’s really horrible. Unfortunately the western mass media pretend that these Iranian jerks are representative of Iranians inside Iran, but it’s a big lie. These bastards are dead in Iran, and the world should know the younger generations of Iranians and their intellectuals. In 2009, after the Ashoura day, the fake intellectuals could discourage the people and save their beloved Islamic regime. But now they are so disgraced and discredited in Iran. The world should know that 2010s is not like 1970s or even 1990s. Now Iran has about 20 million university-educated people and thousands young and real intellects. They have not any voice or media now, but the future belongs to them. They certainly will topple the Mullahs regime, establish a secular Republic, and throw the fake Iranian intellects in the trash can of history. Ganji, Behnoud, and other worthless Iranian bastards, are like other worthless traitors, mercenaries, and Iranian baboons in the trash can of Iran’s history. This entry was posted on Saturday, November 5th, 2011 at 7:55 pm and is filed under Mousavi and his Friends, Mullah Mafia, People Movement. You can follow any responses to this entry through the RSS 2.0 feed. Both comments and pings are currently closed.